West Chelsea Historic District. Image: LPC. Former industrial neighborhood receives landmark protection. 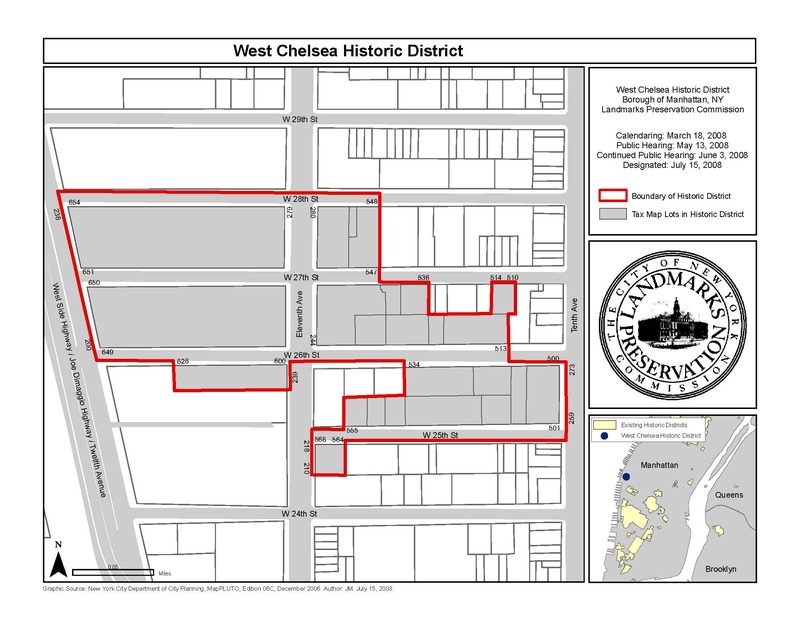 On July 15, 2008, Landmarks voted unanimously to designate seven blocks in West Chelsea as a historic district. The new historic district lies between the West Side Highway and Tenth Avenue, and is roughly bounded by West 28th and West 25th Streets. An industrial area for most of its history, West Chelsea was a manufacturing center in the mid-19th Century, with sawmills, ironworks, and coal yards; few buildings from this era remain. By the early 1900s the area became a center of the printing industry, as well as manufacturing and warehousing. As railroad companies were displaced from the Gansevoort Market area, they moved to West Chelsea and built freight yards and warehouses. Notable buildings in the area include the individually landmarked Starrett- Lehigh Building, the 1912 Otis Elevator Building, and the Cass Gilbert-designed R.C. Williams & Company Building. At the hearing held on May 13, 2008, the owner of a former stable at 554 West 28th Street and representatives of Chelsea Piers, which owns the New York Terminal Warehouse Company’s Central Stores, asked Landmarks to exclude their buildings from the district. 5 CityLand 76 (June 15, 2008). Mary Beth Betts, of Landmarks’ research department, recommended the inclusion of both buildings as contributing to the district’s character. Landmarks voted to designate the district without change. Commissioner Margery Perlmutter called it “unlike anything else in the city,” and “a piece of Chelsea history we are railrapidly losing.” Chair Robert Tierney encouraged owners of property in the area to explore ways to reuse their buildings, stating that the buildings possessed “the potential to animate the district even more.” Commissioner Diana Chapin also expressed her hope that Landmarks staff would assist owners in finding ways to reuse their property. LPC: West Chelsea Historic District, Manhattan (LP-2302) (July 15, 2008).